A modern, fun and exciting course specifically designed to take teenagers from intermediate level up to B2 level. 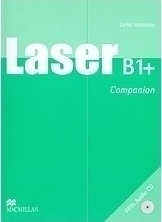 Laser B1+ is designed to bridge the gap between B1 (intermediate) and B2 (FCE) level English. It provides comprehensive coverage of the grammar and vocabulary required at this level as well as extensive language skills practice. Γράψε μια αξιολόγηση για το Laser B1+ και βοήθησε σημαντικά τους άλλους χρήστες!